Sherry A. Rogers, M.D. - Detoxify or Die by Sherry A. Rogers, M.D. Home / Books / By Author / Sherry A. Rogers, M.D. 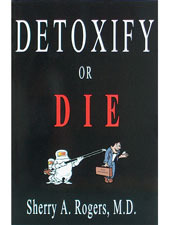 / Detoxify or Die by Sherry A. Rogers, M.D. Enlarge Image Email to a Friend Detoxify or Die by Sherry A. Rogers, M.D. Product Description: We are all a toxic cesspool of the lifetime accumulation of chemicals from our air, food, and water. U.S. EPA studies of chemicals stored in the fat of humans show that 100% of people had dioxins, PCBs, dichlorobenzene, and xylene while another analysis of the exhaled breath of humans showed carcinogenic benzene in 89% and perchloroethylene in 93%. And these chemicals are just the tip of the iceberg. For now we have the proof that it is the steady silent accumulation over a lifetime that produces most diseases, including cancer. But medicine merely sees every disease as a deficiency of some drug or surgery, or tells us there is no known cause or cure. There is now no question that these accumulated toxins are behind nearly every disease, symptom, injury and malfunction of the body. But get ready for the greatest medical discovery of the decade. If we get these ubiquitously unavoidable toxic chemicals out of the body, we can reverse and even cure the most hopeless diseases. Publisher: Sand Key Company, Inc.
About the Author: Sherry A. Rogers M.D. is a diplomat of the American Board of Family Practice, a diplomat of the American Board of Environmental Medicine, a Fellow of the American College of Allergy, Asthma and Immunology, and a Fellow of the American College of Nutrition. She has been in private practice for 32 years in Syracuse NY, has published over a dozen books (each described in the back of this book), a referenced newsletter for 13 years, 19 scientific papers, and chapters in textbooks. She has presented her original scientific and clinical work in 4 international indoor air symposia and given well over 100 physician lectures in 6 countries in medical schools, hospital residency programs, CME-accredited symposia and physician refresher courses, does over 100 radio shows a year, TV, magazine articles, personal consultations with non-patients, and more. The Scientific Basis for Selected Environmental Medicine Techniques by Sherry Rogers, M.D. How To Cure Diabetes by Sherry A. Rogers M.D. No More Heartburn by Sherry Rogers, M.D. The E.I. Syndrome Revised by Sherry Rogers, M.D. The Cholesterol Hoax by Sherry A. Rogers, M.D. The Cure Is In The Kitchen by Sherry Rogers, M.D. Is Your Cardiologist Killing You? by Sherry A. Rogers, M.D. Pain Free in 6 Weeks by Sherry Rogers, M.D. Tired or Toxic? by Sherry Rogers, M.D. The High Blood Pressure Hoax! by Sherry Rogers, M.D. The claims made about specific products throughout this website have not been evaluated by the United States Food and Drug Administration and are not intended to diagnose, treat, cure or prevent disease. The information provided on this website is for informational purposes only and is not intended as a substitute for advice from your physician or other health care professional. You should not use the information on this website for diagnosis or treatment of any health problem or other treatment. You should consult with a healthcare professional before starting any diet, exercise, or supplementation program, before taking any medication, or if you have or suspect you might have a health problem. The product ingredients and images displayed on this website may differ from information contained on or in current product labels. N.E.E.D.S. (Nutritional Ecological Environmental Delivery System) is an international mail-order resource that specializes in providing products, information, and education in the areas of Chemical Sensitivity, Environmental Illness, Fibromyalgia, Celiac Disease, and Candida. Our selection of products includes Vitamins and Supplements, Environmental Equipment [air & water purification, portable saunas, oral hygiene, seasonal affective disorder (SAD) and electromagnetic field (EMF) products], Gluten-Free Foods, Personal Care, Domestic, and Pet Care items, and a variety of books.